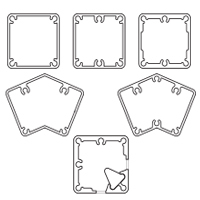 The basic infill options are illustrated below. 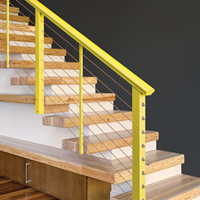 However, we can also assist with custom infill such as textured, etched or decaled glass panels, special picket designs, or even wood strips or panels for solid barriers or fences—the Aluminum Railing System adapts. 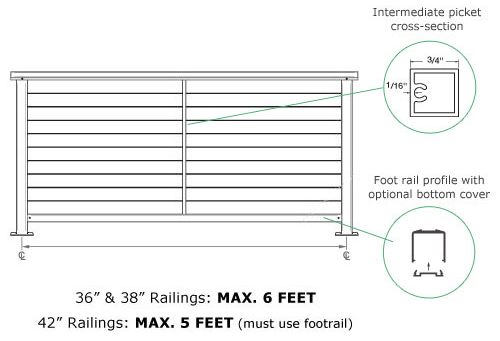 All infill options require a Cap Infill Channel and a horizontal Foot Rail (Foot Rails are optional for 36" and 38" high frames using horizontal cable infill). 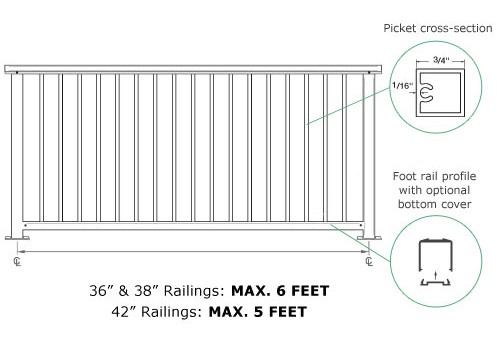 These support the railing infill and help reinforce the frame structure. 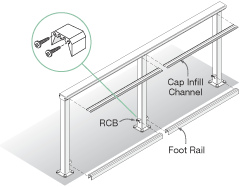 Foot Rails connect to the posts using Rail Connecting Blocks (RCBs) and Cap Infill Channels snap into the underside of the Cap Rails. Each infill type has a specific corresponding Foot Rail and Cap Infill Channel design. Foot Rails and Cap Infill Channels are available in 10-ft and 20-ft lengths that can be cut to size in the field. 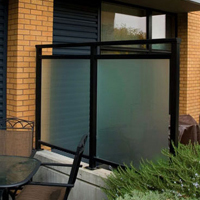 Clear or custom tinted panels that are easily inserted into vinyl lined slots in the Cap Infill Channel and Foot Rail; no special mounting hardware needed. Glass panels are shipped cut to size after the frames are constructed and final opening measurements are submitted. 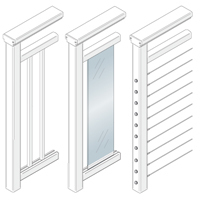 3/4" square aluminum pickets that come cut-to-size, ready-to-install. 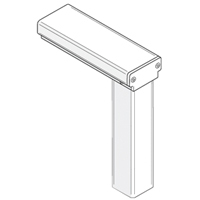 Pickets come powder coated to match the frame color and are secured to the Cap Infill Channel and Foot Rail with screws. 1/8" diameter, type 316 stainless steel cables that come prefabricated to size, ready-to-install. 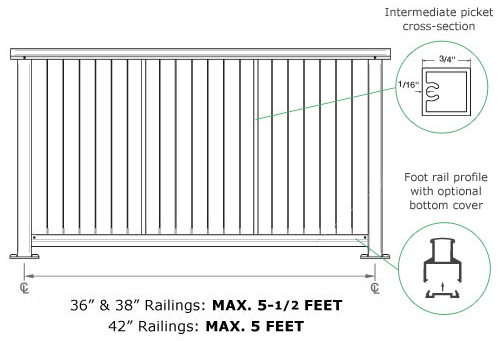 Maximum post spacing is 5-1/2 ft on center (residential), 5 ft (commercial) with 2 intermediate aluminum pickets. 1/8" diameter, 316-grade CableRail stainless steel assemblies include all of the attachment fittings and come prefabricated in standard lengths that can be trimmed to length in the field. A vertical intermediate picket is used mid-span to minimize cable deflection. All post and pickets (except for those used on stairs and ramps) come pre-drilled, ready for cable installation. 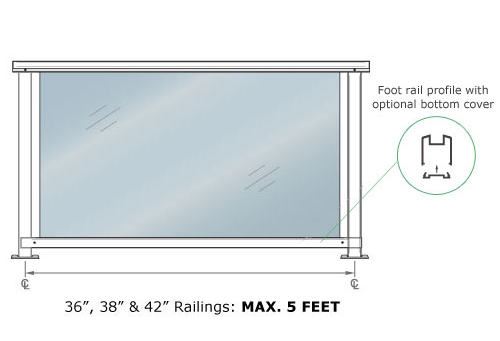 Horizontal Foot Rails are required for 42" high frames and may be used as an option on 36" and 38" frames.